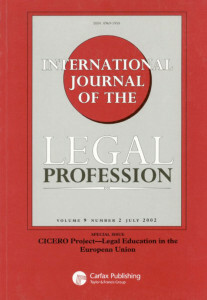 "Legal education without the law - lay clients as teachers and assessors in communication skills"
Abstract: This paper reports an empirical study of the use of simulated clients to assess (facilitate the learning of) interviewing skills and communicative competence of law students at the University of Hong Kong (HKU) from February 2013 to April 2014. In this period, about 400 HKU Postgraduate Certificate in Laws students participated in interviewing exercises with simulated clients, who are lay persons trained to portray clients in a realistic manner and to assess communicative competence by standardized rubrics designed in Scotland since 2006. HKU Faculty of Law is the first law school in Asia to adopt this standardized client program to assess law students’ interviewing skills. The paper will present the data analysis of assessment results of the students and their evaluation of this experiential learning program. Our analysis confirms the reliability and validity of using standardized clients as assessors of interviewing skills. It also reveals the necessity of modification of the original design of standardized client program, particularly in relation to the assessment aspect of it, according to specific cultural and commercial needs in an Asian business city like Hong Kong. Click here to download the full article.